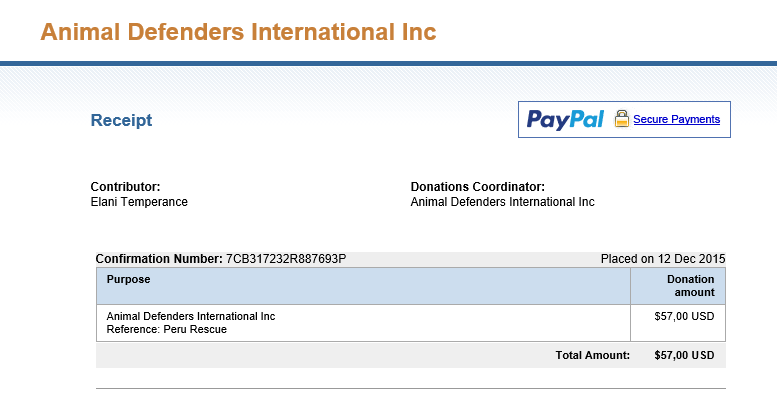 We are very proud do announce that the members of Pandora's Kharis have contributed $57,- for Animal Defenders International this month. Animal Defenders International (ADI) is a major international campaigning group, with offices in London, Los Angeles and Bogota, who lobby to protect animals on issues such as animals in entertainment and their use in experiments; worldwide traffic in endangered species; factory farming; pollution and conservation. From this moment on, pitches are open on the Pandora's Kharis Facebook page. 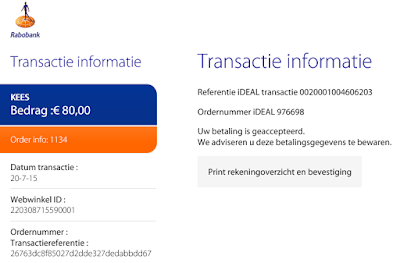 You can vote for your desired cause until December 21, 2015. Thank you in advance! 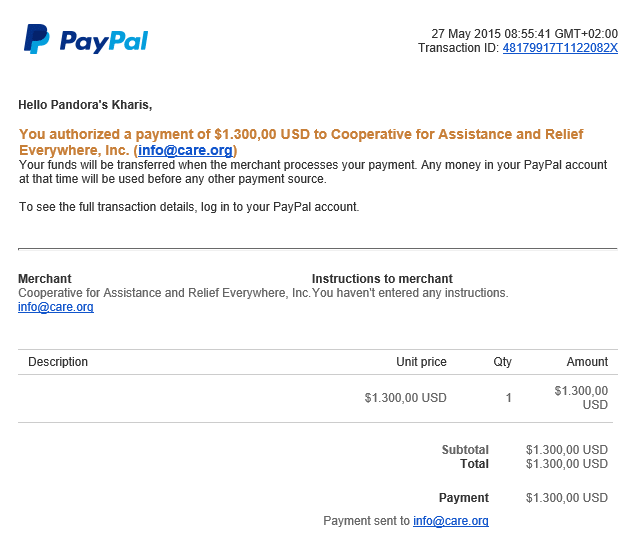 We are very happy to announce that SyrianAid has become Pandora's Kharis' Pyanepsia 2015 cause! 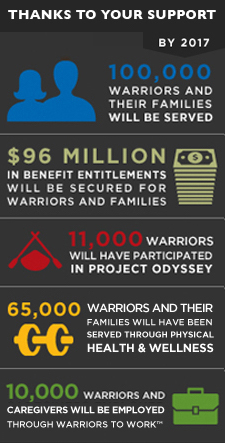 The deadline to donate is November 13, 2015. 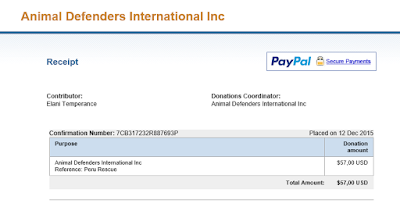 You can do so by using the 'PayPal option to the side or by donating directly to baring.the.aegis@gmail.com. Thank you in advance! 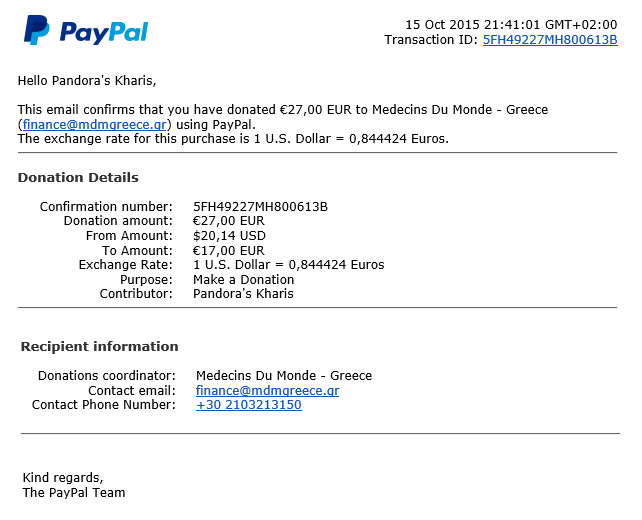 It was a bit of a slow (and short notice) fundsraiser, but $ 31,- have been raised for Doctors of the World Greece. 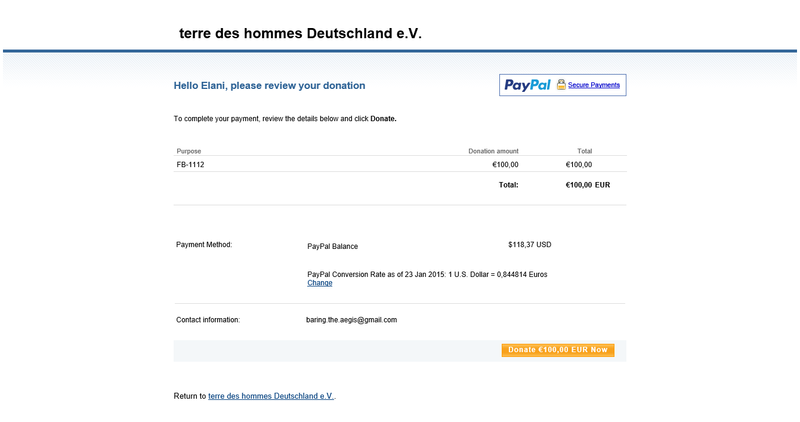 Thank you for your donations, if you have made one! From this moment on, pitches are open on the Pandora's Kharis Facebook page. 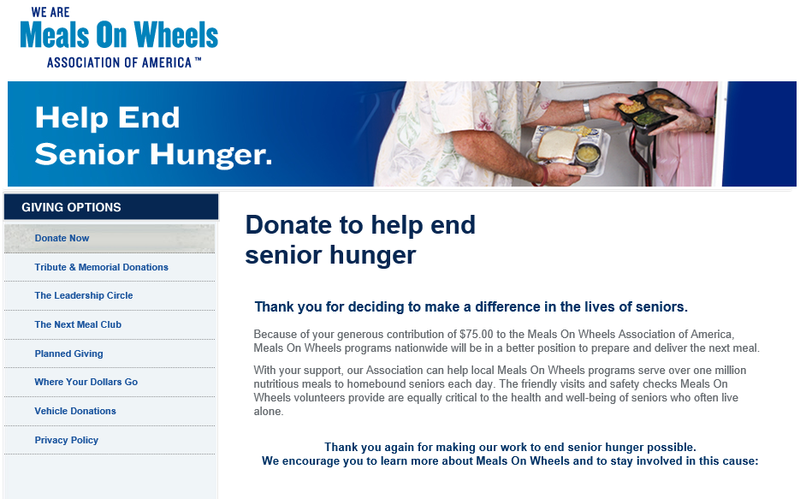 You can vote for your desired cause until October 22, 2015. Thank you in advance! This month, we do a round-up of worthy causes which have been selected by the members of Pandora's Kharis in 2015 but which did not make it in the votes. The League Against Cruel Sports is the leading UK charity helping to prevent cruelty to animals associated with sports such as fox hunting, game bird shooting and wildlife crime. Over nine decades of campaigning, the League has developed effective ways to thwart such sports through calling form and bringing about, legislative change; educating the general public and gaining public support for the issues at hand; and causing difficulty for the people inflicting cruelty. All these actions help animals on a day-to-day basis. But there is always more to do. They rely on public support to carry out their work, which includes campaigning to keep the Hunting Ban and preventing illegal hunting with dogs which, despite the Hunting Act, is still happening around the UK. Save the Children invests in childhood – every day, in times of crisis and for our future. In the United States and around the world, we give children a healthy start, the opportunity to learn and protection from harm. By transforming children's lives now, we change the course of their future and ours. Save the Children is currently on the ground providing critical help and health relief, working with health ministries in Liberia, Sierra Leone and Guinea to help fight the Ebola outbreak. This cause builds Ebola health centers, cares for orphans, trains health workers and provides protective kits and essential medical equipment. Your generous donation could help ensure that they reach vulnerable children. Do you have a favourite out of these five? Vote for your favourite in our poll until August 5. We will announce this month's winner on August 6, 2015. 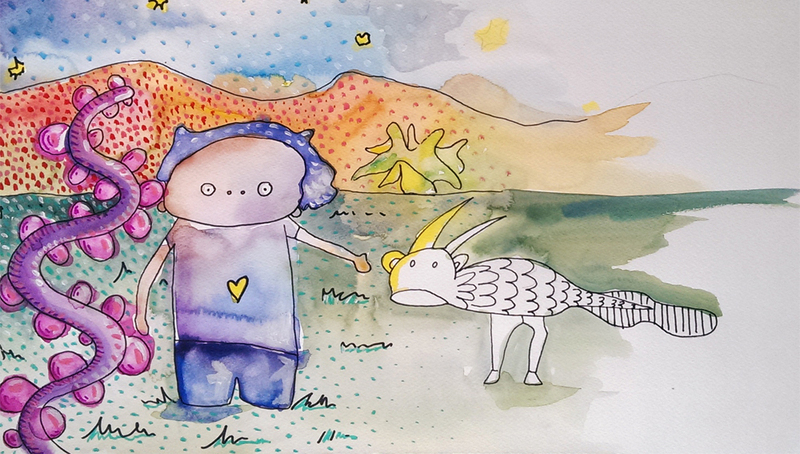 Maaike Kramer and Marjolein Witte, Dutch artists and art teachers, are working hard to crowdfund a new project. They are in the process of creating a picturebook for and by refugee children in The Netherlands (although the book will be translated into many languages after publishing (including English, Arabic, and French)). They came into contact with these kids after being asked by the local government to make a mural at the refugee centre and afterwards they just wanted to do... more. So they started teaching art classes at the kids' school and now they will use their stories and their drawing in a picture book that is meant to help non-refugee children (and adults) understand these kids, and for refugee children to see themselves reflected in the pages of a beautiful book. Of course a project like that needs money. Books need to be printed, materials bought, and people paid to do the lay-out and translations. 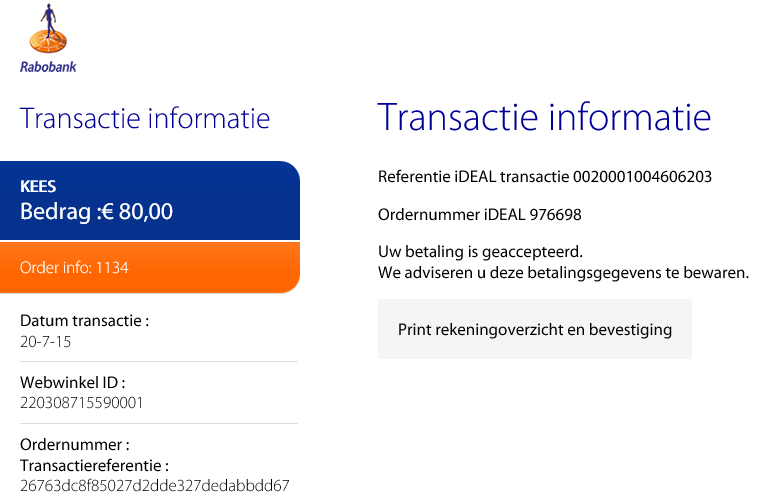 Total costs: about 6000,- euros. They have made about half so far and I would like to help them push their total even further. You may cast your vote here or in the comments until July 18, 2015. Thank you! On 25 April, and earthquake with a moment magnitude of 7.8 or 8.1Ms. Its epicenter was approximately 34 km (21 mi) east-southeast of Lamjung, Nepal. As of 30 April, it's taken the lives of over 6000 people. It was the most powerful disaster to strike Nepal since the 1934 Nepal–Bihar earthquake. Some casualties have also been reported in the adjoining areas of India, China, and Bangladesh. Continued aftershocks occurred throughout Nepal, with one shock reaching a magnitude of 6.7 on 26 April. The country is at continued risk of landslides as well. 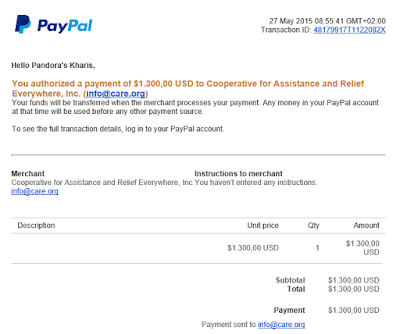 In short, Nepal needs help, and the entire Pandora's Kharis community felt there was no need for a vote: our donation goes to Nepal, to help the survivors survive these terrible times and eventually rebuild. To do this, we have selected CARE as our Mounukhion 2015 cause. CARE has worked in Nepal since 1978, with programs focused on areas including food Security, HIV/AIDS, health, education, water and sanitation, and the empowerment of women and girls. CARE's past responses to emergencies in Nepal have included response to massive landslides in Nepal’s Sindhupalchowk district in August 2014. Their emergency response teams specialize in providing life-saving food, water, shelter and health care. 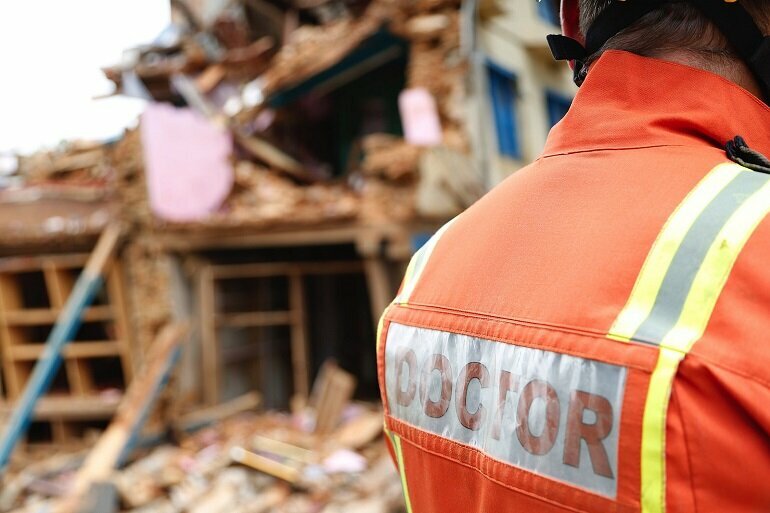 CARE has more than six decades of experience helping people prepare for disasters, providing lifesaving assistance when a crisis hits, and helping communities recover after the emergency has passed. CARE, which works in 90 countries around the world, places a special focus on women, children and other vulnerable populations, who are often disproportionately affected by disasters. In 2014, our emergency response and recovery projects reached nearly four million people in 40 countries. CARE staff are on the ground providing people with temporary shelter, food, and water purification. They plan to distribute emergency shelter and hygiene kits this week to nearly 2,500 vulnerable people impacted by the earthquake in Nepal. Distribution of 250 kits are planned Wednesday in Gorkha, a rural area near the epicenter where it’s estimated that up to 80 percent of the homes are damaged. 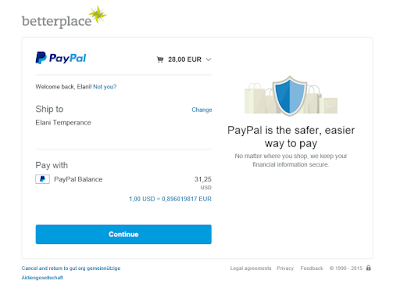 You can make your donations to this life-saving cause until 19 May, 2015, by clicking the 'donate' button to the side, or by transferring the funds directly to baring.the.aegis@gmail.com with PayPal. Thank you in advance. 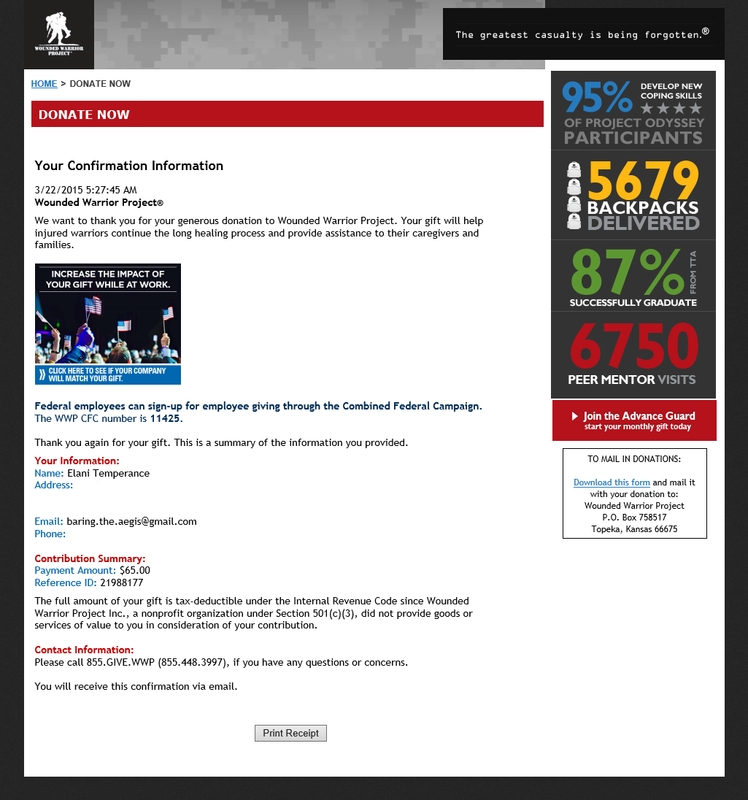 Update: because of the cause, the deadline has been extended for one week, to May 26, 2015. 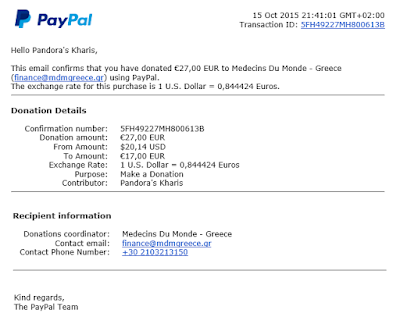 Members of Pandora's Kharis have come together to raise $65,- for Naoto Matsumura. 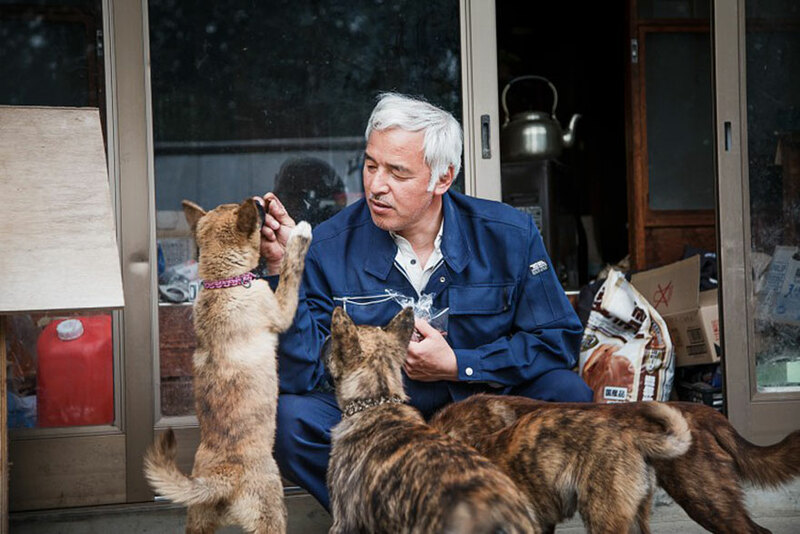 He is known as the ‘guardian of Fukushima’s animals’ because of the work he does to feed the animals left behind by people in their rush to evacuate the government’s 12.5-mile exclusion zone. He is aware of the radiation he is subject to on a daily basis, but says that he “refuses to worry about it.” With our donation, Matsumura will be able to continue his good work and save many animals in need.